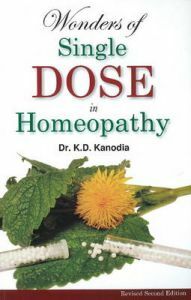 Millions of pearls of wisdom are scattered in the ocean of knowledge imparted by the pioneers of homeopathy. There is a requirement to assemble these pearls (read cured cases) in one place. Dr K D Kanodia with his untiring efforts compiled these cases which have been cured by masters with a single and minimum dose at one place. This compilation will guide you as a light house to the right path. It also discusses how to apply various doctrines of science explaining complementary, antidote, diagnostic pointers, cautions to be taken with remedies and specific pointers in pathological cases more strongly. In addition various guidelines given by masters which act as milestones are mentioned at appropriate places. Dr. K.D. Kanodia completed his education from the universities of Patna & Punjab. He has been a recipient of "Appreciation Award in Homeopathy" from Board of Homeopathic System of Medicine, India. At present he is serving homeopathy by practicing in charitable dispensaries & renowned hospitals and has written many books on Homeopathy.